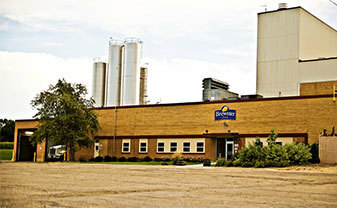 Our second production plant was added in Stockton, Ill. in 1998. This plant employs about 100 people and strictly produces Swiss cheese. The whey processing division of Brewster Cheese turns the cheese-making by-product into condensed whey solids at the Stockton location. The whey produced in this facility specifically is sold as a concentrate and is used as an ingredient in other food products. We test all of our milk, cheese and whey products – both inbound and outbound – in our Quality Control department to ensure we always produce the highest quality products. Contact us today if you want to learn more about the capabilities of our Stockton facility.